Ideal for everyday use in the classroom or in the conference room, the PJD5 series of projectors feature simple-to-use, entry-level models that deliver essential features for any budget. 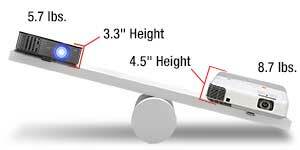 Uses less watts per lumen than other comparable projectors. And with high contrast (with DynamicEco), these projectors are the bright choice for business and education. Advanced DLP (Digital Light Processing) technology allows you to experience crystal clear, razor-sharp and life like images with the same DLP technology that Hollywood relies on. For fast action, the response time is also on the order of 1,000 times faster than similar LCD based projectors. And with no air filters to clean or change, the latest generation of DLP based projectors from ViewSonic offer amongst the lowest TCO (Total Cost of Ownership) in the industry. ViewSonic’s projectors with BrilliantColor technology features multi-color processing to produce stunning, vibrant colors. Unlike other technologies such as LCD which use just 3 primary colors to produce the image, the ViewSonic projectors use up to 6 separate colors. The sophisticated 6-segment color wheel enhances the yellow color performance that is the key to accurate and vivid color reproduction. With multi-color processing, colors are richer and more vibrant with exquisite and precise detail. ViewSonic’s PJD5 Series projectors feature a filter-less design. Unlike LCD projectors that require the user to clean, sometimes to replace, filters after every 100 to 300 hours of operation, ViewSonic’s PJD5126 projector is filter-less, eliminating the need for filter cleaning or filter replacement. This saves you significant maintenance dollars and labor over the projector’s lifespan, and lowers your total cost of ownership (TCO). ViewSonic DLP projectors provide reliable picture quality you can trust and superior color performance you can count on after thousands of hours of usage. Built on DLP technology, the ViewSonic PJD5 Series projectors virtually eliminate image degradation known as color decay – yellow/faded tint that LCD projectors may develop after extended use. Even after years of use, the ViewSonic projectors will still produce a stunning, sharp image that lasts. With the DynamicEco button on the remote, take command of presentations by dimming the screen imageup to 70%. The projector will also auto activate DynamicEco when the unit is not in use. When DynamicEco is activated, the lamp’s power consumption is significantly reduced - a great energy-saving design for a low total cost of ownership (TCO). 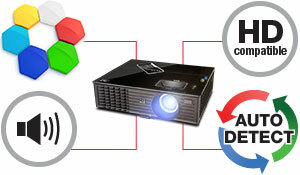 With support for DLP Link technology, you´ll have amazing 3D capabilities at your disposal. All that’s required to unlock 3D capabilities on ViewSonic PJD5 Series models with 3D ready are ViewSonic PGD-250 3D active shutter glasses, 3D content and 3D-enabled video card. 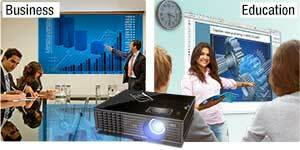 Unleash 3D experience with the ViewSonic projectors today. The new advanced lamp technology from ViewSonic extends the lamp life up to 6,000 hours** and saves you on replacement lamp costs. With only a slight 20% decrease in brightness, the Eco-mode function can extend the life of your lamp by almost 50%** and up to 6,000 hours in some cases. Other benefits of Eco-mode operation include reduced power consumption, as well as less heat and audible noise output. It´s good for the environment and great for your budget. The Eco-mode function will definitely help lower your total cost of ownership (TCO). The PJD5 series projectors are mostly around 3.3 inches in height and lightweight at approximately 5.7 pounds, making them the perfect portable projector for mobile sales and business travelers. Backed by our 25 years reputation for quality and reliability, ViewSonic offers one of the industry´s best overall projector warranty with 3-year limited parts and labor, 1-year lamp and first year free Express Exchange service*. Don´t be fooled by seemingly longer warranties out there in the market that exclude the more vulnerable systems and moving parts.